The following blog is the next in a series of profiles of jazz musicians performing in China drawn from my forthcoming book Jazz in the Land of the Dragon. The jazz tradition in Japan has roots that are almost 90 years deep. Apart from the voluminous content of William Minor’s 2004 book Jazz Journeys to Japan, there is other evidence to show that even prior to the Japanese military attack on Shanghai, China, in 1937 many Japanese musicians had adopted jazz as their repertoire of choice, not only for the many Westerners living in Shanghai, but also for the large Japanese population in that city. Further, it is no cultural accident that jazz found its way into the Japanese mainland in the first quarter of the 20th century: many steamships in the 1920s-1930s made stops in Japan, especially Kobe, on their way to and from the rest of the Orient, such as China. We should not be surprised, then, to find Japanese jazz musicians performing in China in the current century. One such person is drummer Izumi Koga. 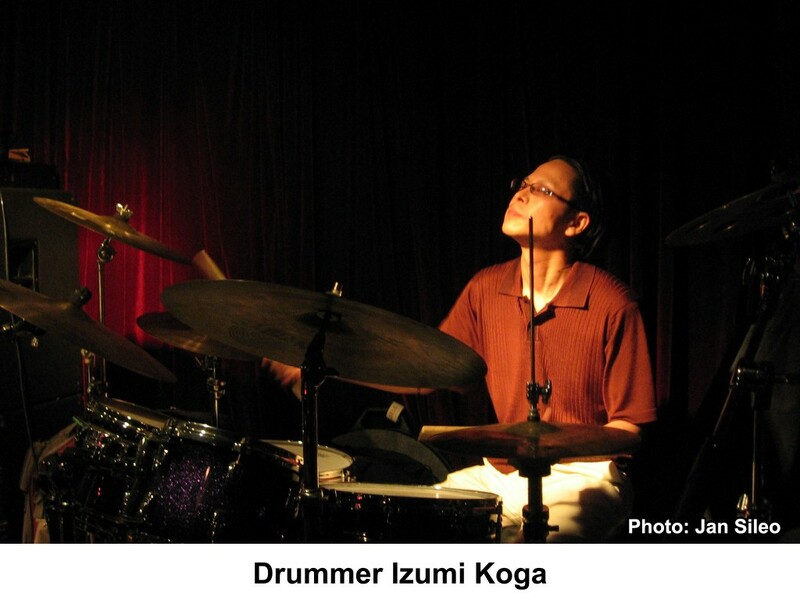 Tokyo-born Izumi Koga, listened to his father’s Art Blakey and Benny Goodman jazz LP records when he was a kid. He didn’t like pop music, but he did like rock, and especially jazz. His online resume states he studied at the Berklee College of Music between 1990-1993 under the tutelage of Osamu Minagawa. Minagawa himself has an interesting background. In October 1969 the then six-year-old was chosen by his aunt, leader of a Japanese school choir, to record, at the request of Nippon Victor, a Japanese-language version of “Kuroneko no Tango.” This tune was originally Italian and meant “Black Cat Tango.” The song reached number one in the Oricon chart and sold three million copies. Managawa became the youngest artist ever to have a million-selling record. 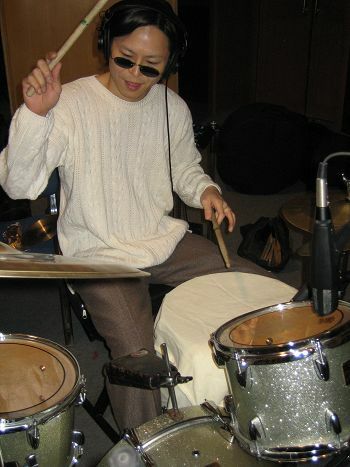 Following graduation from Berklee, Koga arrived in Beijing in 1993. He liked it sufficiently enough that he decided to stay. 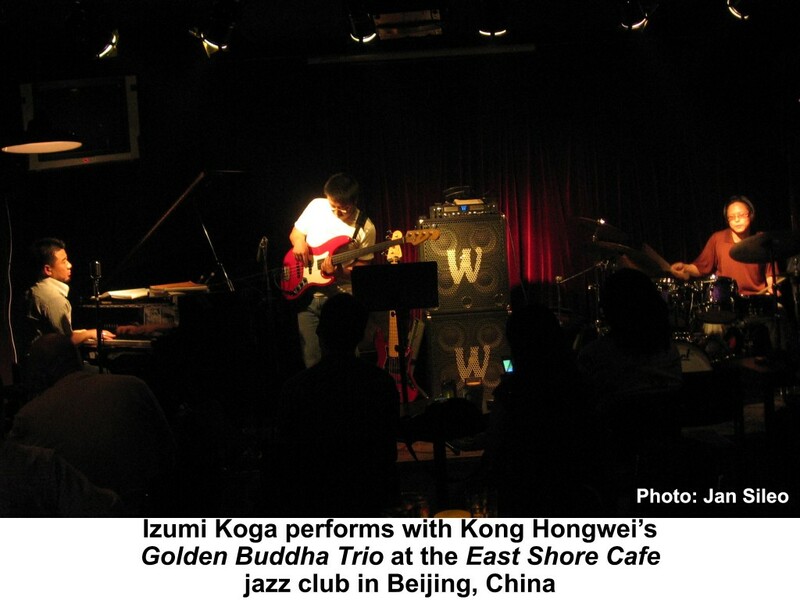 Koga commented on the Beijing jazz scene since he arrived almost 13 years prior: “It’s better than before. The musicians are improving. There are a couple schools teaching jazz music, so a lot of the younger generation are starting to playing jazz music.” He was referring to the Midi School and Contemporary Music Institute, where he teaches. The Contemporary Music Institute, as of a few years ago, had 3,000 students; the Jazz Department, approximately 280. There are a total of 50 drum/percussion students. Other students are studying piano, bass, guitar. Koga commented on why students are gravitating towards jazz: “Students like this kind of music. Some students love it. They are studying very hard, and also playing in hotels, clubs, and rehearsing and practicing now that they have a chance to study and play. They love it because of the improvisation. They get freedom. They can express themselves. They like the jazz music form. He was asked what one factor will make jazz grow in China? “The economy, of course. Nobody wants to pay for it. If a lot of clubs, or some hotels, or companies give students or working jazz musicians a chance to play, it’s going to grow much faster. Koga performs with some of the leading jazz ensembles in Beijing, among them pianist virtuoso’s Kong Hongwei’s Golden Buddha Trio, the Xia Jia Trio, and saxophonist Liu Yuan Jazz Group. The latter is considered the father of jazz in China. All three ensembles perform with regularity at the East Shore Café in Beijing. Koga’s prestige among jazz drummers in China was exemplified when he served as a panel judge for Sabian’s first drumming contest in Beijing in 2007. Sabian, heaquartered in Meductic, Canada, is renowned as the world’s leading designer and manufactuer of musical cymbals. 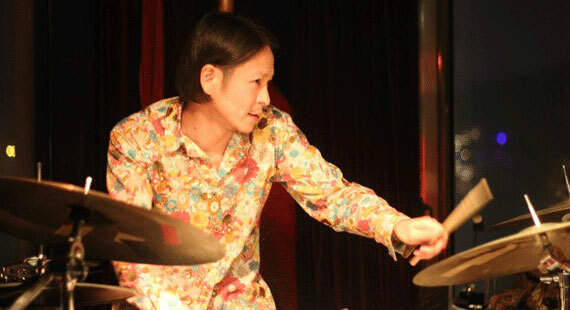 Koga has since become dean of jazz department at the Beijing Contemporary Music Institute. Please write to me at meiienterprises@aol.com if you have any comments on this or any other of my blogs.